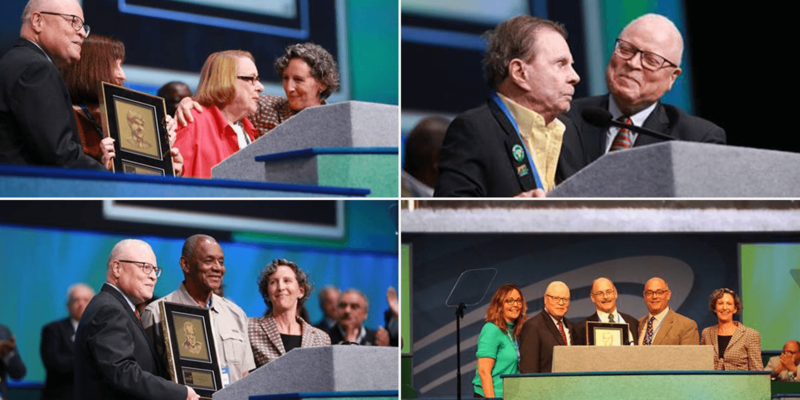 Past leaders of AFSCME were recognized Monday in a surprise ceremony during which President Lee Saunders and Secretary-Treasurer Elissa McBride honored them with moving tributes and a special resolution honoring their service to our union and our nation. Past Presidents Arnold Zander, Jerry Wurf, Jerry McEntee and former Secretary-Treasurer Bill Lucy were honored for their contributions not only to AFSCME, but to the labor and progressive movements. A poignant retrospective charted the lives and careers of the past AFSCME leaders: Zander’s humble beginnings in Wisconsin as he fought alongside his fellow civil servants against an unfair patronage system, out of which AFSCME was born; the stratospheric growth seen under Wurf’s leadership; McEntee’s staunch support of equal pay, ardent opposition to privatization, and visionary leadership in turning AFSCME into a political powerhouse focused on the union’s growth; and Lucy’s instrumental role in the Memphis Sanitation Workers’ Strike and his leadership beyond AFSCME in human and civil rights. Saunders awarded plaques to the families of Zander and Wurf, and to McEntee and Lucy. Through the adoption of a special resolution, McEntee and Lucy were given the honorary titles president emeritus and secretary-treasurer emeritus, respectively. Saunders also announced that a special hall would be established at the international union to honor these leaders. The plaques will be displayed at AFSCME headquarters in Washington.